It seems like many still love and appreciate the magic of a trip to the cinema. Lucky for us Thailand has a thriving & developed cinema culture, making for a nice break from the heat and a great place to take a date (or maybe even meet someone new…). With a variety of cinema styles and English language titles which stretch far beyond the latest Hollywood blockbuster, you’re sure to find something to your taste. Here are my favorite 6 Bangkok cinemas. Scala was built in 1967 and has seen few changes since, making for a wonderful retro chic feel. From the moment you walk up the grand double staircase under the giant chandelier, you’re transported back in time. Select your seat by crossing off a box on a paper grid, grab your fresh $1 popcorn, cross the fabulous art deco flower domed foyer, pass your ticket to the bow-tied usher and settle back in your red velvet seat. This old theatre is massive (even a seat close to the front offers great screen views) however don’t worry, the technology is new. With tickets costing only 100 baht ($3), for movie buffs who like the romance of a bygone era, this is a must. Located directly opposite Siam Discovery Center at Siam Square Soi 1, it’s easy to find. 2 blocks along you’ll find LIDO cinema, also offering cheap 100 bt movies in smaller cinemas sans 1960’s design (however it retains the ushers in bow ties – some of them are from the 1960s….). For total immersion, there’s nothing like IMAX, and there’s an IMAX smack bang in the middle of town at Siam Paragon shopping center. With tickets between 300 and 450 bt ($10-$15), it’s slightly more expensive that other cinemas however with the right movie the experience is more than worth it, especially in 3D. My most recent IMAX was Gravity in 3D and the feeling of tumbling through space with George Clooney was so real that I can still close my eyes and see George spinning above me. To impress a potential lover or simply as a treat, nothing beats Gold Class cinema. Although the concept has been around for a long time, Thailand does it especially well. My favorite Gold Class is also in Paragon Cineplex. Whilst you wait for the movie, relax in bliss with a complementary massage in the lush private foyer as a spiffy waiter brings you free drinks and popcorn. Don’t forget to order a glass of wine to be delivered to your huge reclining armchair as you snuggle under your blanket. At 700-800 baht, ($23-26), you can enjoy super luxury first class cinema for almost the same price of a normal ticket back home. Centralworld and Central Embassy, both just down the road, offer similar deals. If you really want to go VIP, Siam Paragon’s Enigma theatre ups the ante with 3,000 baht ($100) tickets for 2 seats. You’ll receive a glass of wine and snacks, large reclining sofa seats and state of the art sound technology. 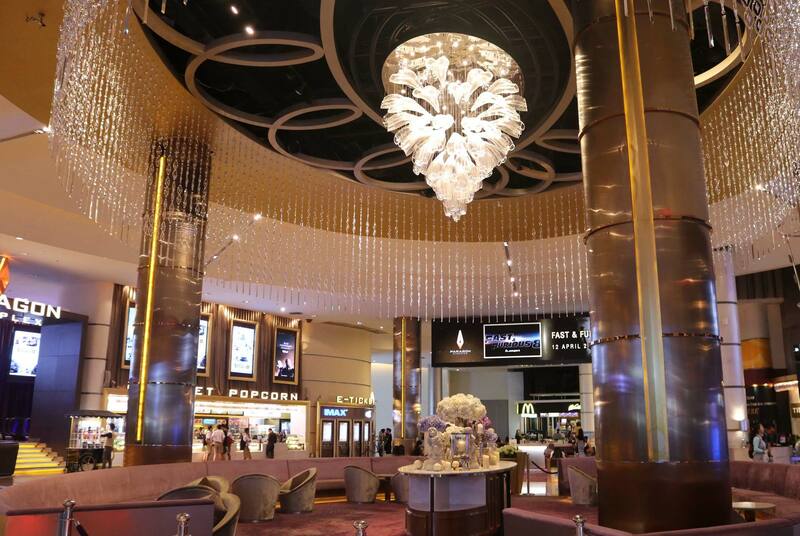 For general movie viewing, the recently rebuilt Centralworld cinema is one of my favorites. With a variety of screens to choose from, each cinema offers large comfortable reclining seats and plenty of leg room. The cinema is also a large supporter of world cinema and regularly hosts film festivals so look out for interesting titles which may be playing. Located in the 6th largest shopping center in the world, there’s plenty of shopping and hot guys and gals to keep you occupied before and after the movie. House RCA is located in the RCA complex, well-known for its bars (it even has a lesbian bar), clubs and live music scene. The cinema has 2 small theatres with comfy leather chairs and plays a combination of art house, foreign language and popular titles. At only 100 bt ($3) a ticket, it’s a bargain. What I love most about this cinema is the foreign language films which attract limited support, meaning that we often find ourselves the only people in the cinema enjoying our very own private screening. Before any movie commences in Thailand, the King’s song is played and everyone in the cinema stands to show their respect. Bangkok is also host to a range of film festivals throughout the year. Currently running until September 7 is the Thai Short Film Festival at the Bangkok Art and Culture Centre. Coming in October is the World Film Festival of Bangkok, “a showcase for independent films and new work from rising talents to cinema masters to show the continuity from generation to generation as a vital component in the development of the film industry” from October 17-26 at SF World Cinema in Centralworld mall. There are numerous cinemas all over the rest of the country. To check locations and screening times, here are links to the two largest chains, Major and SF. Whilst it might not seem like the most obvious holiday activity, Thailand’s cinemas offer great comfort and value. So grab a hot guy or girl and a bucket of popcorn and enjoy!